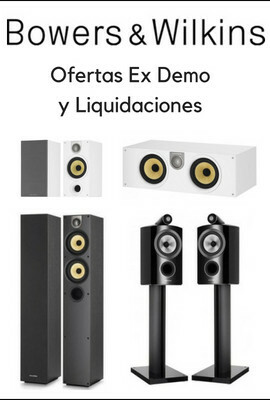 Previous video standards (composite, "S", component, RGB) transmit an analog signal. When two digital devices are connected with HDMI or DVI, the digital signal stays clearer and noise-free. 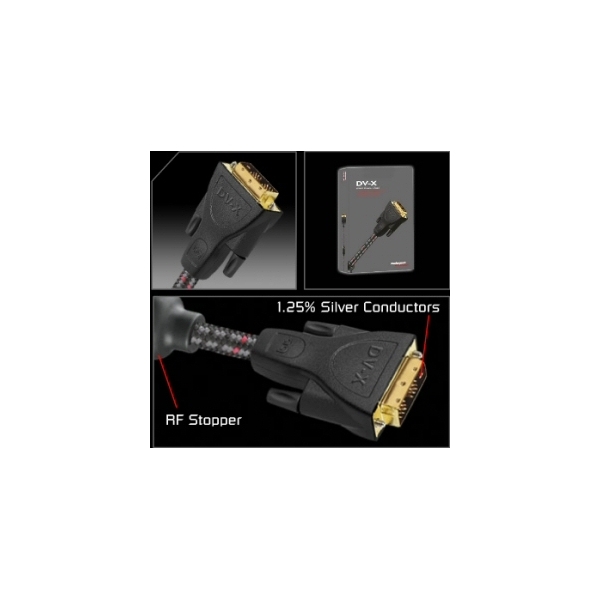 Both the DVI-D and the more recent HDMI transmission standards come from the same "working group." Both systems transmit the same uncompressed digital video signal. The only two differences you must know: 1) The connectors are different. 2) HDMI inputs and outputs are capable of digital audio, DVI-D is video only. AudioQuest premium quality adaptors, from DVI-D to HDMI or from HDMI to DVI-D, allow either HDMI or DVI-D cable to be used with any equipment. Both HDMI and DVI-D cables can carry digital audio, but only HDMI equipment can send or receive digital audio. See pictures below. 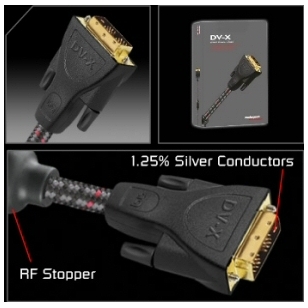 AudioQuest/CinemaQuest DV-X uses large 1.25% silver conductors. Solid High-Density Polyethylene is used to minimize loss caused by insulation, and to insure critical geometry stability. An RF Stopper prevents interference problems.